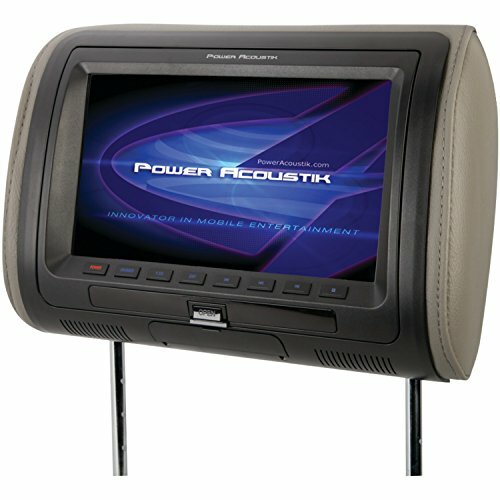 Keep the back-seat passengers entertained with the H‐71HD 7" Universal Headrest Monitor with MHL Mobile Link & Interchangeable Skins from Power Acoustik. The MHL Mobile Link input enables screen mirroring for select devices. This headrest comes with a 16:9 widescreen 800 x 480 monitor that auto selects between NTSC and PAL video signals. The unit also has a hardwired headphone output, a dual-channel wireless IR transmitter (uses HP-12S) and both aux A/V input as well as RCA A/V aux in and out for an aux source or opposite headrest. The headrest itself can tilt forward or backwards. It has a .38" locking pole with .5" and .56" adapters as well as 4.38"-8.25" pole width adjustment. Includes interchangeable gray, beige and black skins. Dimensions: 7"H x 10"W x 5.5"D.